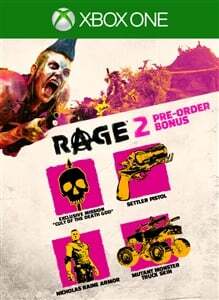 Pre-Order RAGE 2 to receive: • Limited Time Exclusive Mission: “Cult of the Death God” • Settler Pistol • Nicholas Raine Armor • Mutant Monster Truck Skin The RAGE 2: Deluxe Edition gives you: • Rise of the Ghosts: An exciting campaign expansion to RAGE 2 available by Summer 2019. • Doom BFG • Wasteland Wizard Cheat Codes • Battle Standard • Progress Booster An asteroid has annihilated 80% of the earth’s population, and humanity’s numbers are dwindling. 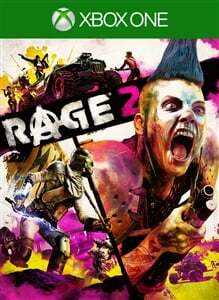 Ruthless and bloodthirsty gangs roam the open roads and the tyrannical Authority seek to rule with an iron fist. As Walker, the last Ranger of the wasteland and a threat to their power, you have been robbed of your home and left for dead. 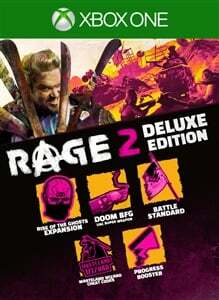 Now you’ll have to rage for justice and freedom. 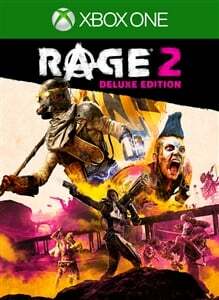 With ludicrous vehicle combat, super-powered first-person mayhem, and an open world full of emergent madness, you will tear across an unforgiving wasteland battling sadistic gangs to find the tools and tech needed to crush the oppressive rule of The Authority once and for all.